NURSES in the public sector here will be given pay rises, broader job scopes and better career progression, in new moves to retain them and attract new faces. The Ministry of Health (MOH) is taking these measures, which it announced yesterday, even though the attrition rate has been falling, as more nurses are needed to meet the rising health-care demands of the ageing population. The attrition rate was 8 per cent last year, down from 9 per cent in 2011. MOH estimates it will need an extra 1,400 nurses a year between now and 2020, on top of replacing those who quit. Last year, the nursing population grew by only about 1,100. A major change is how much nurses will get paid. MOH said yesterday that about 23,000 nurses in public health care and MOH-supported intermediate and long-term care institutions will get pay rises of between 5 per cent and 20 per cent in the next two years. They will also get an additional half a month's annual bonus from December this year. This, said Health Minister Gan Kim Yong at the Nurses' Merit Award ceremony yesterday, is to ensure that their pay is "commensurate with their expanding roles and competitive with the market". "Nurses play a very important role. They are on the front line; they are on the ground. They are the backbone of our health-care workforce," he said. The changes were proposed by the National Nursing Taskforce, which was set up in December 2012 to chart the course of the profession. Yesterday, Mr Gan formally accepted its 15 recommendations in four broad areas. Currently, enrolled nurses - the lowest tier and mainly graduates from the Institute of Technical Education (ITE) - earn about $1,975 a month in public healthcare institutions. Registered nurses with diploma qualifications earn about $2,500. "We hope that by enhancing their remuneration, we will signal greater recognition for this profession," Mr Gan said. Speaking to the nurses at the ceremony, he added: "I am not Santa Claus, but I think you deserve it." Senior, experienced nurses will be given greater autonomy after the new changes kick in. This includes the authority to make some diagnoses or order certain medication and treatment. For instance, a nurse clinician could immediately prescribe the appropriate medication for a diabetic patient having a hypoglycaemic attack, rather than having to wait for a doctor's go-ahead. "We want to give our nurses greater autonomy so they can take on greater responsibility and do more complex functions," Mr Gan said. "In this way, we will be able to maximise their potential." A new National Council of Nursing Education to coordinate nurse education across the various levels will also be set up. Changes in the fourth area will ensure better career progression, especially for lower-tier nurses. Previously, enrolled nurses from ITE needed to get a grade point average of at least 2.8 - out of a maximum of 4 - before they were allowed to further their studies to become registered nurses. Now, as long as enrolled nurses have at least three years' work experience and a good report from their employers, they will be eligible for the upgrading course. 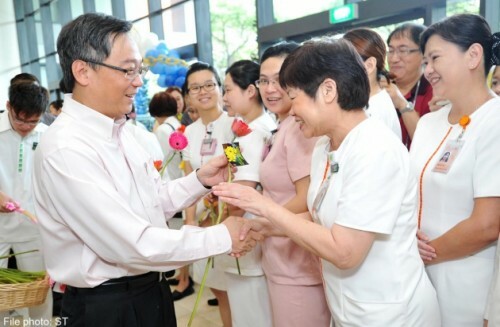 "I'm very happy for the enrolled nurses who are my colleagues," said senior staff nurse Zarina Ahmad of Changi General Hospital. "It was a pity that they couldn't go further because of all the constraints."